An Alabama federal judge now handling all federal breast implant cases recently entered an order expediting discovery in the cases so that trials could be held in fall 1993. The order entered last week by Chief Judge Sam C. Pointer Jr. of the Northern District of Alabama in Birmingham states that discovery in the cases should be completed by early next summer. "That's the quickest discovery schedule anybody's ever seen with mass tort litigation," said Kenneth B. Moll, a Chicago lawyer serving as the liaison counsel for the State of Illinois in breast implant litigation. Pointer has not yet decided whether cases should be consolidated for trial or if some issues should be tried separately, according to the 14-page order. "For planning purposes, however, it is anticipated that some cases might be ready for trial on liability and damages as early as - but absent extenuating circumstances, not earlier than - fall 1993," the order states. "There is the possibility that some special issues, such as the responsibility of one defendant for the action of another, might be ready for separate trial prior to that time." Moll said, "I think [trials] will start as early as [next] July or August." Pointer's possessive order also allows plaintiffs to file a master complaint and the defendants to file master answers by Oct. 15. Plaintiffs also are allowed to serve the defendants by registered mail through the defendants or their national counsel, rather than using law enforcement officers for service. "The service process to national counsel is going to reduce the cost and aggravation for everybody," said Moll, a principal in McDowell, Moll, Fitzgibbons & Drew Ltd. Plaintiffs planning to file breast implant lawsuits should use the master complaint, and all previously filed cases are automatically amended with counts in the master complaint, Moll added. Pointer, who Moll said is an expert in mass tort litigation, also is directing that the depositions of defendants frequently named in complaints throughout the nation and experts whose testimony could be used in different trials throughout the U.S. be videotaped and transcribed. The videotaped depositions can be used in different simultaneous trials, eliminating delay because of the unavailability of witnesses, Moll added. Protective orders entered previously in breast implant cases, with a few exceptions, will be vacated and voided on Nov. 15, according to the order. In re Silicone Gel Breast Implants products Liability Litigation (MDL-926), No. CV 92-P-10000-S. The period during which plaintiffs could opt out of the class action lawsuit was indefinitely extended under the order, Moll said. A joint plaintiff and defendant document depository and library has been established in the U.S. District courthouse in Cincinnati and the material should be available for distribution by Dec. 1, the order said. Copies of depositions and other discovery materials are expected to be available by using computer modems, which can connect with the document depository, Moll has said. 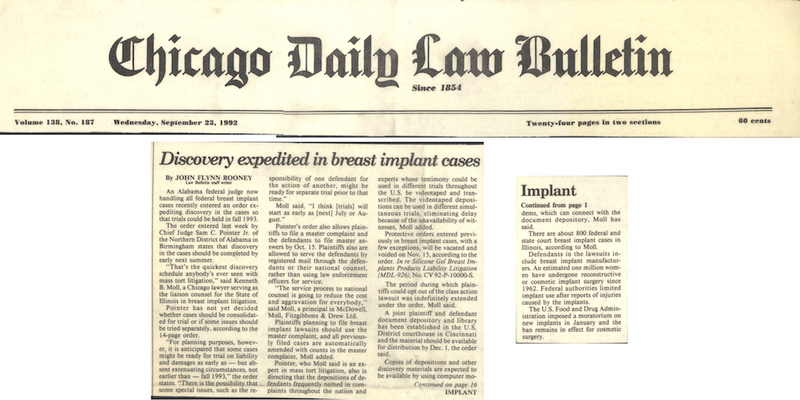 There are about 800 federal and state court breast implant cases in Illinois, according to Moll. Defendants in the lawsuits include breast implant manufacturers. An estimated one million women have undergone reconstructive or cosmetic implant surgery since 1962. Federal authorities limited implant use after reports of injuries caused by the implants. The U.S. Food and Drug Administration imposed a moratorium on new implants in January and the ban remains in effect for cosmetic surgery.